A Japanese researcher has found that a polysaccharide known as Fucoidan found in brown seaweeds such as konbu, wakame, mozuku and hijiki, causes various types of established cancer cell lines to self-distruct. It is said that among various seaweeds, Mozuku includes much more fucoidan than the others. 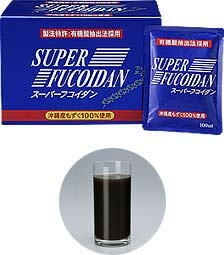 But fucoidan can be obtained by only 1% even from mozuku raw materials. It is noteworthy to know that Okinawans’ seaweed consumption rate is the highest and the cancer death rate is the lowest in other Japanese prefectures. Click the top picture for all about Mozuku Fucoidan. Refer to Shipping Fee by EMS with insurance. Price list will be attached to your email upon your request with your name and address!! recognized as a natural mozuku seaweed extract. Easy-to take capsules. “Okinawa Fucoidan 53.1g” contains the equivalent of 42g of mozuku seaweed extract. Click the picture for the specification. Made from Fucoidan, a rich nutrient found in seaweed and extracted using our original method to maximize its potency. 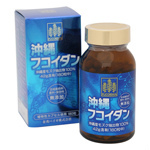 "Fucoidan Extract capsule per bottle contains the equivalent of 25g of mozuku seaweed extract. from Okinawa Mozuku seaweed, using our original method to maximize its potency. Easy-to-take powder granule packets. A Unit box contains the equivalent of 25g of mozuku seaweed extract. Winner of the Prefecture Governor’s Award for Excellence at the 26th Annual Okinawa Industrial fair!! preventing arteriosclerosis, cardiac infarction, etc. pation and cleans the inner intestines. As for the lead time on 10kg in bulk, it takes 20 days to dispatch due to the production on demand. Made from Fucoidan derived from Okinawa mozuku seawed and then uniquely blended with agaricus mycelium extracted by solid cult ure. Fucoidan is a popular health food tha has been the focus of much interest due to its many recognized physiological benefits. Great for all health consicious people. Recipient of the 23rd Naha Mayor’s Incentive Award. Ingredients: Mozuku extract fucoidan, dextrine, powder reduced maltose starch syrup, Agaricus mycelium extract, hydrogenated oil, crystalline cellulose, and sucrose fatty acid exters. Unit box contains 12.5g fucoidan extract. Made from Fucoidan extracted using our original patented method and then uniquely blended with Reishi mushroom mycelium, a popular functional ingredient. Packed in easy-to-take liquid form. Unit box contains the equivalent of 30g of mozuku seaweed extract. Click the box picture for the specification. 3g of fucoidan extract bulk powder per pack (75ml), this product is provided as an easy to take retort extract of fucoidan that was extracted by the original patented manufacturing method. This product has been in much demand not only from the individual patients but from the hospitals and drugstores. And many more.....for protection and improvement for your health. Dosage: After opening transfer it to a glass or teacup and drink it as it is. You can also add hot water or dilute it to your taste. The features of "Dry Mozuku"
Time required to return raw Mozuku is 6 to 8 minutes with water, while it takes a few minutes with hot water. It will increase 25 to 30 times in volume. 1). one year presevation is possible at room temperature. 2). It is convenient for carrying due to its light weight. 4). Just dip it into soup as it is for the cooking. 5). No great difference in texture, as compared with raw Mozuku. 6). no strong smell peculiar to seaweeds. 7). You can take much nutrient of Mozuku even in small quantity because it is condensed to Dry Mozuku. 8). It takes no time to defreeze it for cooking. preserve it in the referigerator once it's opened. Please click Mozuku Powder 500g. for the specification. Mozuku fucodian extract powder is mainly used for this product, but fortified with Morom vinegar powder wtih much amino acids and citric acids, and Yaeyama chlorella powder, one of the world top chlorella brand. Colaboration with Fucoidan, Moromi vinegar and Chlorella boost your imune stystem and fight against cancer cells. Especially, amino acids and citric acids much included in Moromi vinegar help Fcoidan absorbed in body fast in Citric Acid Cycle also known as the Kreb cycle. This product has been developped as private brand with no label on the bottles.